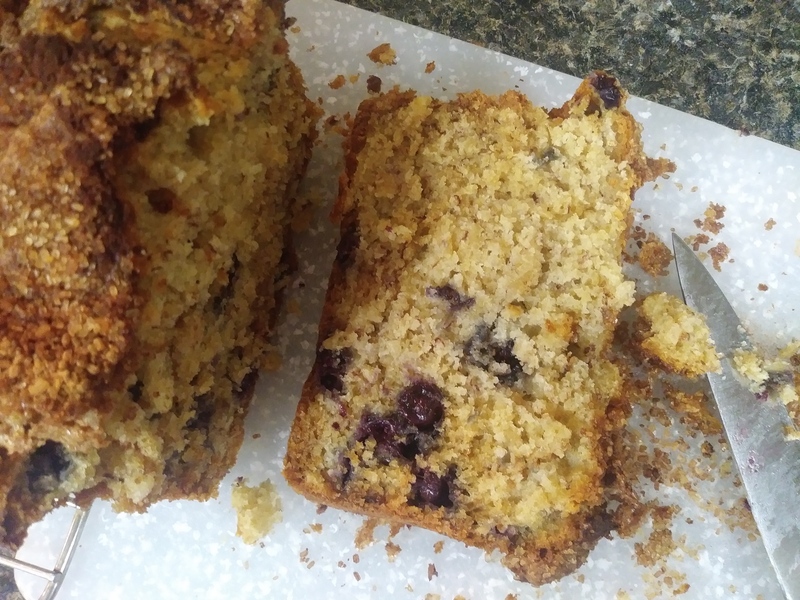 Quick breads are so easy and satisfying to make. 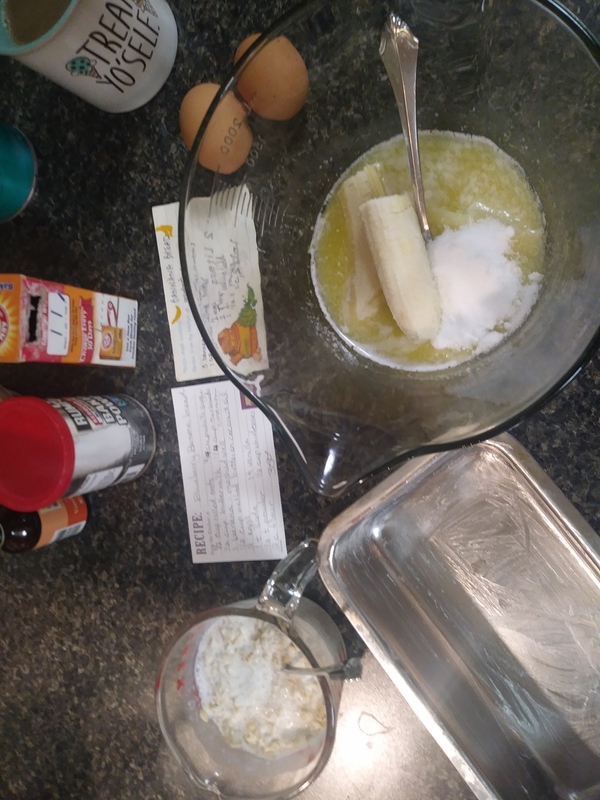 This recipe is a direct offshoot of my Grandmother’s Banana Bread which I blogged about in 2012. 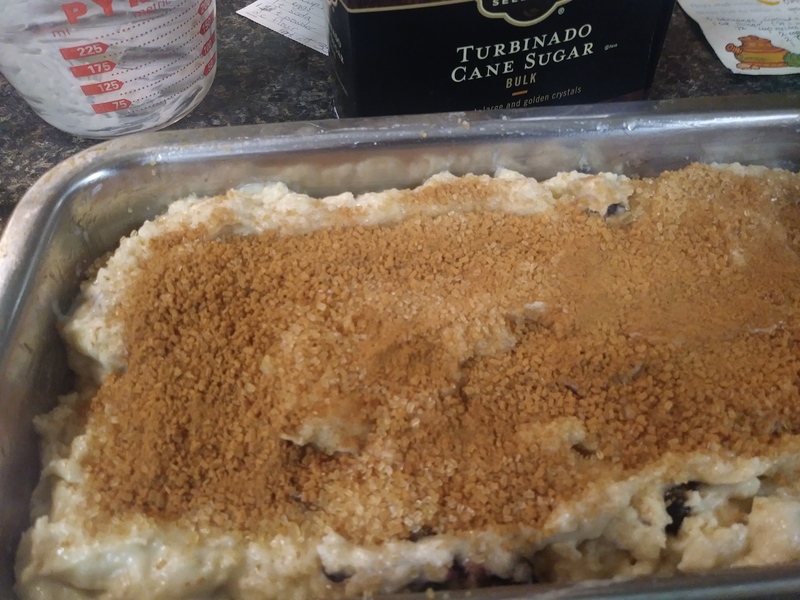 It’s not too high in sugar and includes some healthy rolled oats and blueberries. Please try it and let me know how it goes. Don’t worry about exact measurements for this one, it’s practically foolproof! Preheat the oven to 350 degrees and prepare the baking pan(s) with a good smear of butter; this recipe works well in three mini loaves or as muffins. 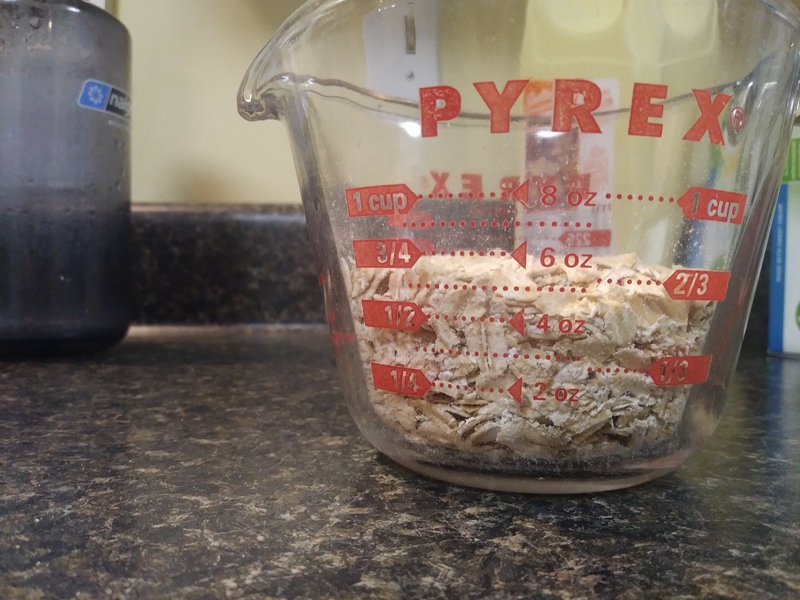 Begin by measuring the rolled oats into a bowl or jug like the one pictured. Add the buttermilk to the oats, stir and let this combination sit while you gather and prepare the rest of the ingredients. The buttermilk will tenderize the oats. Melt the butter in a large mixing bowl and add the 3/4 cup sugar and the banana. Mash the banana with a fork and mix well. Add the eggs and vanilla and continue mixing until well combined and relatively smooth. Now add the oats/buttermilk mixture and stir it all up. Add the flour, salt, baking powder and baking soda to the bowl. 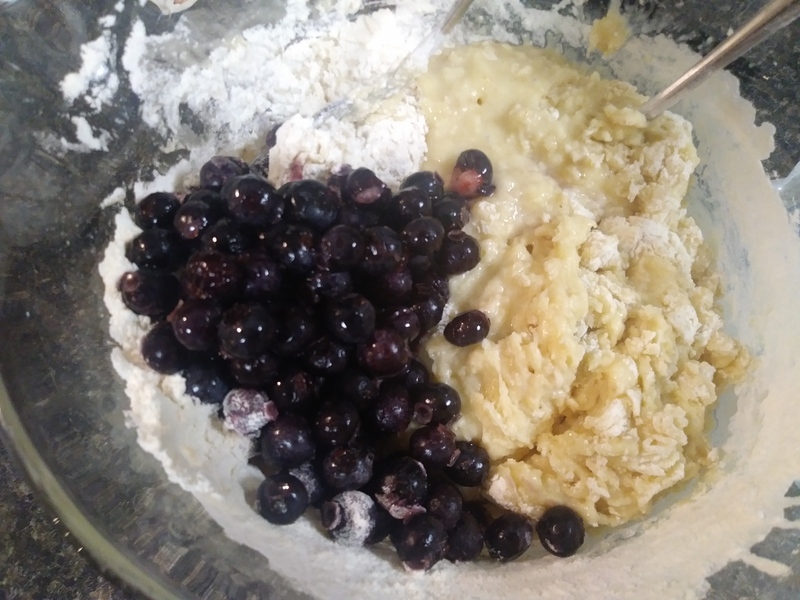 Begin to mix the dry ingredients in gently and then add the blueberries and continue to mix gently until just combined. Pour the batter into prepared pan(s) and smooth out the top. Combine the 3 Tablespoons turbinado sugar and the cinnamon in your 1/4 cup measuring cup and sprinkle this all over the top. Turbinado sugar has larger crystals than white sugar and will give a wonderfully crunchy top. Bake for 1 hour or until a toothpick inserted in the center comes out clean. Let the bread cool in the pan for 10 minutes and then turn out to continue to cool. I couldn’t believe it when my husband said he thought it might even be better than banana bread! The crumb is tender and moist and the crunchy top really sets it off. This recipe was inspired by these Pistachio Chai Muffins I blogged about several years ago. I made them again recently and decided I could do better by adding more nutrition and less sugar. Applesauce is a great natural sweetener and also allows you to reduce the amount of fat in baked goods without sacrificing moisture. Many recipes actually use applesauce as a replacement for butter, but that seems a bit extreme. I also employed a favorite trick for adding rolled oats to muffins which I discovered during my first few months of blogging. It’s well known that buttermilk is wonderful for baking, but it’s also great for tenderizing (I guess that’s why it’s good in marinades). So if you measure out the oats and buttermilk and let them soak for a few minutes, there will be absolutely no tough fibrous texture in your baked goods. I researched and wrote all about the wonders of buttermilk in this post. I have since learned even more about the fascinating world of butter, cultured butter, buttermilk, and making various dairy products at home. For example, did you know that the buttermilk we buy in the store is nothing like the buttermilk our great great grandparents made at home? That was a by-product of cultured cream that was left in the churn overnight (that’s the ‘cultured’ part) and then churned into butter the next day. I digress, but you can read more about buttermilk here! One other thing I like about this recipe is that all the ingredients are easy pantry staples. However, since I was out of chai tea bags I had to use cinnamon, cloves and ginger instead. Preheat the oven to 375 and prepare the muffin tins. This recipe will make 12 large or 16 skimpy muffins. Measure the rolled oats and buttermilk into your mixing bowl first so they can soak while you get everything else ready. Add all the wet ingredients (egg, applesauce, oil, vanilla) to the oats and buttermilk and stir together. Measure the dry ingredients and mix into the wet until just combined. It’s a good idea to sift the dry ingredients together to remove any lumps and incorporate the leaveners into the flour, but not entirely necessary for this recipe. Scoop the batter into muffin tins and top with chopped pistachios. Bake for about 25 minutes, or until a toothpick inserted in the center comes out clean. Let cool in pans for 5 minutes, then remove to cool a bit more before eating. My son and husband agreed that this new recipe is superior because these muffins are very moist and yummy.